I’m conflicted about vege2go in Lygon Street, Brunswick. The food is okay, the prices are somewhat okay, the place is clean and pleasant. And the folk are very nice and they’re kiddy-friendly and all. But while they preach saving the earth, with Peter Singer sermons plastered over their walls, the place whifs of petrochemical excess. Not only are the chairs and tables plastic, but their smoothies and juices — even ‘eat-in’ versions — are served in plastic cups with plastic lids. Half the cutlery is disposable plastic, too. You may as well be eating at McDonald’s. And much of their produce is out of season, and so would’ve accrued lots of fossil-fuelled food miles. I’ve seen melon & berries in their winter fruit salad, for example. And the pantry stuff on their shelves is all imported. And when the vege2go folk preach good nutrition, perhaps they might reconsider zapping their food in the microwave. Several studies show significant nutrient loss from food subject to microwaving. And perhaps they should reconsider selling the coloured lolly-water posing as health tonic. Compare and contrast with Each Peach, just a few shops up. The folk there source local produce, would not at gunpoint even consider microwaving their food, and they sell home-made pantry goods. Their furniture and adornments are reused and recycled stuff. And their walls don’t preach saving the planet. They’re just doing it, in their own delicious way. Perhaps vege2go just has more mainstream appeal, which is good. Different strokes, I suppose. The Avenue has been blessed with a gorgeous little squdgey 3-month-old lassie who’s keeping me sleepless, lactating and honest. (But criminally neglectful of my poor chickens.) Having split with The Father Formerly Known As Bloke On The Av, I’m venturing into the dark depths of single parenthood (though TFFKABOTA still visits daily). Life is good, but with property settlement, mortgages and all those other adventures, the prospect of losing my beautiful home has forced me to ruminate on ways to be thrifty. My grandma used to save pineapple skins and boil them up. She’d simmer them for a couple of hours, strain them through cheesecloth, and make cordial or jelly with the syrup. A friend once told me off for discarding the bottom bits of broccoli. I’ve now devised a recipe with them: toss them in a hot wok with macadamia oil, crushed macadamias, white pepper, sumac and lemon. You can throw in shredded nori and serve on soba noodles. YUM. I HATE the seedless variety of watermelon — and not only because it tastes rank. It’s because the fat black seeds of the old variety are YUMMY, high in protein and vitamin E, and should be a delicacy. In fact they ARE a delicacy in Singapore, where they are the key ingredient* in the celebrated Mooncake. And watermelon skins! LOVE ‘EM! Yep, the green bits. Crispy, juicy, full of vitamin A and gorgeous when sliced thinly and tossed into salads. I’ve done this a couple of times and no-one has noticed. I suppose they thought twas cucumber, unless they were being polite. Watermelon rinds can also be pickled, of course. Anyhoo, I’m too goddam sleep-deprived to think of more, but would be SO thankful if I could find a use for green apple peels. See, I’ve been making a lot of Stephanie Alexander’s quick apple cake of late (but to make it really special, add lemon rind, sultanas and walnut), and the curly peel is now taking up acreage. It makes good compost and chook scraps, but it seems a shame not to make it into sumthin’. * though Wiki lists the paste from watermelon seeds as one of many optional ingredients: (五仁, wǔ rén): A filling consisting of 5 types of nuts and seeds, coarsely chopped and held together with maltosewalnuts, pumpkin seeds, watermelon seeds, peanuts, sesame, or almonds. syrup. “We were a group of four people and opted for the set menu for the first time there, we were disappointed with the food for a number of reasons. the first was the mezza was very oridinary especially the marinated octopus which was quite mushy also the bread was sliced rye and had nothing to recomend it, with the mains the meat was orginary and there was only one average size piece each. We finished with a fruit platter also very small portions and not very appertising in presentation. We expected it to be more authentic Greek/Cypriot cuisine with that flair the Greeks have of making fairly plain food tasty. In order to improve the food little things like the bread and food portions need to be addressed.We were there on the first night it opened and we hope it was only a glich. A very positive review of Each Peach appeared in yesterday’s Age. I admit given the owner’s background with the superb Loafer Bread I had the impression it was a a bakery rather than a cafe, so thus far I’ve been disappointed with Each Peach. But by all other accounts it’s a fine little establishment. Home-made ginger beer, a three-citrus squeezed juice, an organic hot chocolate and a little “cup of foam” join the coffees. There are toasties of ham and melty Italian fontina cheese, or a selection of sourdough panini using bread from Zeally Bay. Like much on offer here, it’s organic. The panini arrive crunchy, burny-fingers hot, and filled with fresh, pleasantly understated combinations such as thick seams of snowy ricotta and sweet, chunky pumpkin with Coburg pesto – so named because it is made from basil grown in a local back garden – or milky sour goat’s curd with meaty rough-cut green olive tapenade and a wad of rocket. They are very good. Our chooks have gone off the lay for winter, and I find myself furious. When it comes to buying eggs, ‘free range’ can of course mean anything from a vast grassy pasture to an undersized concrete run. And the wholesome-sounding ‘barn laid’ claim, which the RSPCA has — to its eternal shame — endorsed for a tidy sum, is a euphemism for those noisy, cruel, putrid concentration camps in which thousands of debeaked chickens compete for space. To be on the safe side, I avoid those notorious Pace Farm eggs, and to go for certified organic. But just recently, I learned of ethical Green Eggs. My beloved, trusted Sugardough Bakery (left) in Lygon St uses, recommends and sells them, so I thought I’d give them a whirl. “You can’t get fresher than that,” is the Green Eggs motto, and the company has won many awards as an ethical, sustainable free-range enterprise. But when broken into a bowl, these Green Eggs eggs collapsed into a slimy sludge. Their yolks were so pallid that when scrambled, they came out not so much yellow as a pale beige. Our home-laid eggs, on the other hand, have yolks so rich they’re almost burnt orange in colour, and when scrambled, remain an intense sunflower yellow. Our home-laid eggs never collapse when broken: their whites hold together in a firm ring and their yolks sit upright and high. I’m convinced this is partly because our chooks eat a good mix of high-protein unprocessed grains, but more importantly, they eat greens every day. Cabbage and lettuce leaves, grasses, weeds: whenever we go for a walk we come home with green bounty from Coburg’s nature strips. Chooks need and love greens, and the greener your chooks’ diets, the richer their eggs’ yolks. All eggs aren’t equal when it comes to nutrient density. (And as Michael Pollan so elegantly puts it: “You are what you eat eats.”) None of the commercial brands seems to have decent-coloured yolk: a good indicator of chook health, as well as the nutritional composition of the egg. It seems no commercial egg farmer is giving chooks the greens they require — not, it would appear, even at the pastured ‘Green Eggs’ company. Our local chunk of Lygon St has generally been a bit dull. Unless you’re into gambling and McDonalds followed by a bit-of-a-hoon in a motorized wheelchair that doubles as a Jason recliner, in which case you might well enjoy it. I don’t to get to do any of this stuff any more since the four-year-old came along. However things are looking up. At least for me. Artisan Espresso opened recently at 438 Lygon St, down near the tram stop opposite CJ Fabrics. One of the owners, Marinus Jansen (of appetite food store, North Melbourne) has paired up with Josh-the-coffee-roaster-Bailey to provide a little piece of heaven locally. What’s great about the place is they do coffee and ONLY coffee. Well, Ok, they do other beverages, but no food. Soon there will also be a retail coffee outlet opening there from where you will be able to buy your beans. And they are in the process of moving Josh’s roaster onto the premises so soon I’ll be able to tend the chooks and wrangle the vegies (or is that the other way around) while the heavenly aroma of roasting coffee comes wafting up the laneway. Now thats going to be good for productivity! The house-blend, Padre is a great all-rounder and has become our coffee of choice at home with good reviews from all of our vistors. Meanwhile at Artisan Espresso itself you can regularly try the various beans as they are roasted and experimented with. It gets even better. Just a little further up, where the wool shop used to be, an organic bakery and cafe will be opening. 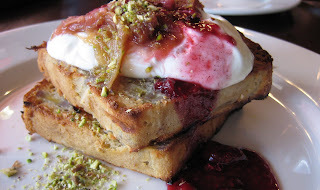 The owner is a pastry chef who previously worked with the guys from Loaf of Bread in Nth Fitzroy. Now I’m looking forward to that! And if you want real unsubstantiated gossip, the old cheesecake shop is currently undergoing extensive renovations and the rumour-mill insists that it is all being done for George Calombaris of The Press Club. Whether or not this is true remains to be seen but it certainly adds to a sense of rejuvenation in the strip. Vegie2Go also opened in this strip of Lygon St late last year and while the franchise-style doesn’t do much for me the Italian based vegetarian food is always delicious. Handy as a take-away alternative. Can’t quite come at eating there. Lush is another new addition; an enormous place (three shop frontages I think) packed full of furniture, clothes, jewellery, and thingies all of a very lush persuasion. Again I have to admit it’s not really my style so I can’t vouch for the place but if you suspect ‘lush’ is what you’re after then it would be worth a look. And of course there are our old favourites, the record shop with a picnic set for sale in the window, the Organic Grocery Store, Casa Della Pasta (who now also make fresh organic pasta), Nabil the hairdresser, (love that waft of patchouli everytime you ruffle your son’s hair) and a fabulous Indian herbs and spices store where you can also pick up the latest bollywood DVDs. Foodworks mind you, I could live without. For the handfull of things I do buy in a supermarket you still can’t go past IGA in Sydney Rd, Brunswick. For Pete’s sake, will you look at this excellent breakfast blog. It’s been going since 2005. Like The Age, it tends to have a southern and eastern inner-suburbs bias, but it’s ace. Should I be worried? Can I take precautions? Do fruit fly like quince? The news that a backyard in Ascot Vale has been quarantined after the discovery of fruit-fly has me in a small, but still significant, panic. How many backyards between that one and mine, and how many contain fruit? I’m guessing, not many, and all of them, respectively. Yet tomorrow’s briefing is “vested interests masquerading as public interest science” claims Greenpeace spokesperson Louise Sales. Comprising scientists who campaigned in support of lifting the bans, it was organised by the Australian Science Media Centre (AusSMC), which claims itself “free of bias”. But absent are independent scientists who warn of dangers of GM food: biochemist and nutritionist Dr Rosemary Stanton OAM; or medical scientist Professor Stephen Leeder; or epidemiologist Dr Judy Carman; or crop research scientist Dr Maartan Stapper. There are many. And third panelist Professor Rick Roush reportedly failed to disclose his research funding by GM companies. Allegedly as a result, Science journal revised its disclosure policy, as it is recognised that industry-funded research tends to be much more industry-favourable than independent research. Obviously Professor Roush missed this. And this. Thanks, Max Franc, for telling me to get off my arse and do another post. Following Marty’s great comment about his concrete patch turned native and vegie garden, here are some before and after snaps of my own. Like Marty’s, our garden has a very different microclimate to what it had a year ago. These pics don’t show my beloved urban crops, but on the roof you can see my plastic planter boxes with lightweight medium and pumpkins planted within. But these pics are old — now the pumpkin crop is covering a great expanse of rooftop. Their superb soft green solar panels are harvesting sunlight and turning it into sweet cellulose, while cooling our house. Joy. The most inexpensive solar-panel-carbon-uptake-insulating-beautifiers ever. I’m hoping the Moreland City Council will get cranky with me for breaching some by-law by having pumpkins on my roof. If this happens, I’ll bludgeon them with the green roof policies of Toronto and Germany, where there is now a whopping 14 per cent of green roof coverage in urban centres, thanks to policy incentive. That’s right: more than one in ten buildings there have some rooftop vegetation! A world expert on green roofs, Germany’s Professor Manfred Köhler, is coming to Melbourne soon to give talks about green roof policy and practicalities. Come along and see him! There will be many green roof experts there. I’ll put some current photos up of my rooftop crop soon. A superb article by Michael Pollan. 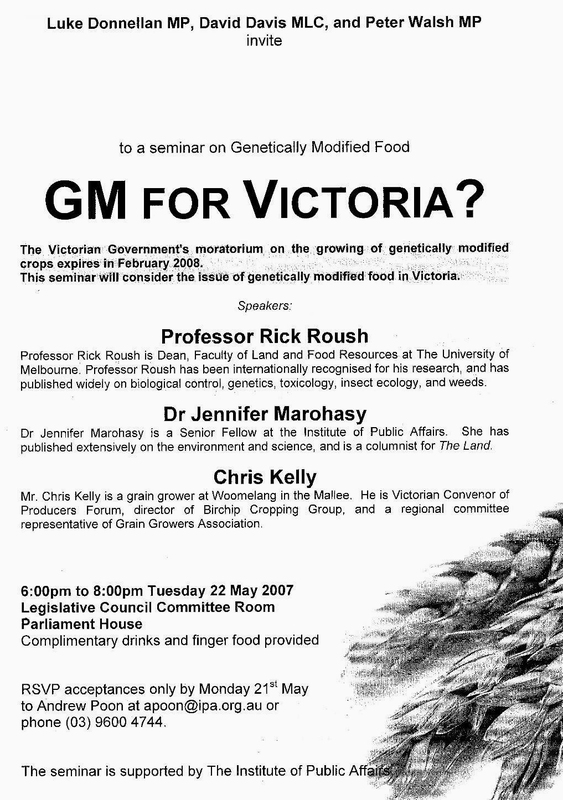 Coinciding with Jeffrey Smith’s Australian tour to promote Genetic Roulette: the documented health risks of genetically engineered foods, yesterday Victorian Premier John Brumby bowed to pressure from big agribusiness and announced, without consulting caucus, that Victoria would overturn bans on GM food crops. Gene contamination knows no borders, and New South Wales has also lifted its bans, to the rancour of other states. Overturning the bans was widely regarded as a done deal at least a year ago, prompting an un-named MP to tell The Age Brumby was “treating caucus like idiots”. So why was Brumby secretive? Perhaps he feared market revolt. Last Tuesday, Coles government relations advisor Chris Mara told a Parliamentary forum that “Coles listens to our customers and over 90% do not want GM ingredients in their food.” Goodman Fielder, Australia’s largest food company, also backs the bans. Tatiara Meats, Australia’s largest lamb exporter, and 250 other food companies also want the bans kept. Why? Because the public does. In polls taken by AC Nielsen, Roy Morgan, Millward Brown, The Age, and Swinburne University and Choice magazine, a whopping majority of Australians (between 70 and 90 per cent) don’t want GM foods. In this morning’s Sydney Morning Herald poll, 84 per cent of respondents don’t want it. Despite agribusiness bodies giving the nod to GM food crops, 80% of farmers surveyed in a 2002 poll taken by the SA Farmers Federation supported a ban. In an August 2003 Biotechnology Australia poll 74% of farmers surveyed were not considering using GM crops. A Biotechnology Australia 2006 study found that “The Australian public see great risks from GM foods and crops and concerns are continuing to rise.” This followed an ABC report that there was “no market” for GM canola in Australia. As big UK, Japanese and US chains remove GM food from their shelves, the EU is discussing the withdrawal of five GM crops. “Consumers are rejecting GM foods. Markets in Europe, Japan, and elsewhere are closing and domestic markets are likewise threatened. This is driving prices down,” Canada’s National Farmers Union reported. This also comes at a time when scientists and farmers internationally are warning about the economic and health perils of GM food, some of which is unwittingly eaten because of inadequate labelling laws. Whether or not Brumby believes these warnings is irrelevant. He has forgotten that in a democracy and a marketplace, the customer is always right. 2006 was the year of renovating, and consequently the year of takeaway dinners, many home-delivered. One morning, it occured to me that I always get the runs (sorry) after eating a meal from a particular Coburg Indian restaurant. Not an especially good — or even moderately good — Indian restaurant (are there any around here? ), but a cheap one. At beer o’clock after renovating, almost anything will go down. I thought little of it. But one evening, sitting down to orders from said restaurant, Bloke on The Avenue and I noticed a hair in our dinner. Deal with it, you might say. But this wasn’t any old hair. About 7cm long, it was exceptionally thick and coarse. It could only belong to an animal like a goat, or a camel. Or a llama, or mule, or wild pig. Then we noticed a second, and a third, and then dozens. We could only imagine what was going on in that kitchen. We complained to Moreland Council, and played a little phone tennis before we gave up on the matter. Anyway, as the man was scooping pink gelati into the cones with no serviette wrapped around them, I noticed his hands were covered in scabby sores, some weepy, and his fingernails were FILTHY. It was sickening, but I had one of those moments where it would seem embarrassing to make a fuss. And nor did I want to disappoint Little One yet again, no Sir. On the other hand, I didn’t want to poison my child, either. So I paid for the cones, noticing that the van’s interior, too, was grimy, and I swiftly suggested a game of throw-gelati-at-the-seagulls. Thank heavens Little One thought that was much bigger fun than eating them. We came home unsullied and I called Moonee Valley City Council, which promptly undertook an inspection, and the next week told me they’d suspended the poor man’s license. councils the power to name premises that have been successfully prosecuted. Overseas studies have demonstrated the health benefits of naming foul premises. After Los Angeles introduced a public grading system for restaurants in 1998, the number of food-borne hospitalisations decreased by 13 per cent. Surely, then, there’s a public interest argument here? A while ago I walked into the little Italian pasta shop on Lygon St, the one where you can buy fresh pastas and sauces they’ve made themselves. While not exactly regulars (we are capable of whipping it up ourselves), we have shopped here before on several ocassions without mishap. The old guy shuffled out into the store and I asked him for some bolognese sauce. He looked slightly bewildered but shuffled out back where he vanished for a very long time. Far longer than usual. When he came back he was holding a dozen eggs! Which he had apparently taken some trouble to put together. They don’t even sell eggs! He had been gone so long and I was so flabbergasted and intrigued by this complete miscommunication that I didn’t correct him. I then picked out some cheese and spinach ravioli from the freezer and asked again for bolognese sauce. He shuffled out back and quickly re-appeared with bolognese sauce. I went home with ravioli, bolognese sauce and a dozen eggs. Something similar happenned to me once before living in an area very similar in many ways to Brunswick, just one of the quirkier joys of multiculturalism. Has any one else had similar experiences? Would you have tried to explain you didn’t want the eggs? And if so how? Strange theatresport moments as you try to act out ‘egg’ in the negative? My gut instinct has generally been if I stuffed up such a simple message then maybe it’s best to leave it. As promised, oh so long ago, I took some photos of revegetated nature strips I’ve stumbled across (sometimes literally). There are actually a lot more than I was expecting, once I started looking for them, so I’ve created a spot for them on flickr. This also means others will also be able to upload any photos they have that they think are worth sharing. If you go to http://www.flickr.com/groups/republicofmoreland/ you can see the ones I’ve uploaded, upload your own, and also start other topics relevant to the greater Republic of Moreland. Of course what we really need is some photos of guerilla planting in action! What I can show you right now is my own first tentative steps in nature strip revegetation. Our street doesn’t actually have nature strips, just some holes in the asphalt where the council planted trees several years ago. Discussions with the neighbours reveal that almost every tree without exception was trashed by, well, they got a bit vague at this point, but it finally came out that it would have been by their sons and friends. The sons are now older and I think even they would look down their noses at tree trashing these days. One neighbour has planted an olive and donated one to me so I have supplemented it with some grasses from my front garden. I plan to imperceptibly extend the boundaries of my ‘nature strip’ until the breadth of our house has been ‘greened’ without anyone having really noticed it. I’ve also promised another neighbour that if she provides a tree I will plant it and then provide all the grasses she needs from my garden. If you are interested in Moreland’s Naturestrip Beautification Guidelines (!) you can download them from here. Now call me insular, but I’ve never heard any ‘resident funkster’ [ahem] drop “It’s very new Brunswick” into conversations at any of these cafés. Maybe because I don’t mix in the real estate and market branding circles that Nina appears to. But I suspect this is not so much ear-to-the-ground, word-on-the-street reportage as… well, something else. Cringeworthy, made-up puff, perhaps. But I’m happy to be proved wrong. If anyone, anywhere, knows of a conversation that “meaningfully” incorporated “It’s very new Brunswick,” please record it here. Postscript: I just googled “very new Brunswick”. Lo and behold: The Age reviewer Matt Preston also used it in a review of A Minor Place: probably the very same review as in the Cheap Eats Guide. He also writes that café is frequented by “art school lesbian” types and “older locals who look like hip, SBS-watching teachers”. Don’t these (apparently Eastern Suburbs commercial tv-watching) Age reviewers ever get out? Brunswick Labornet reports a science and maths boost for public schools around here. A good thing. And timely, considering Australia’s Chief Scientist Jim Peacock has just come out and said that our brightest students are avoiding science. But considering some other wild things Jim Peacock claimed this week, and considering the Bracks’ governments’ apparent closed shop and done deals on important science issues, I’m wondering what sort of science will be encouraged in our schools. Will it be evidence-based science? Will it be science that serves the needs of people? Or will it be the sort of science endorsed by our Chief Scientist? His website doesn’t, as you might expect, endorse “Empirical, disinterested science that meets the needs of society”, but “An independent perspective, based in industry and science”. A big difference when you think about it. And note that industry comes before science. Here’s how the Bracks government decides on GM food issues. It doesn’t consult the 80 per cent of farmers who support a ban on GM food crops; nor does it consult the majority of shoppers who don’t want it. In all polls taken by industry and AC Neilson, and all media polls, the majority of Australians reject GM food. (This majority, according to our Chief Scientist Jim Peacock, are in fact “self-serving” “unprincipled minorities”. So much for empirical science advice. And a bit rich, coming from someone who probably stands to gain from his current lobbying to overturn GM bans.) Nor does the Bracks government consult with our overseas markets that reject GM produce; nor with those independent scientists who oppose GM foods. Instead, it holds closed-shop meetings at Parliament with the industry lobbyists, the Institute of Public Affairs (IPA). Now, from its history, it would appear to me the IPA doesn’t endorse empirical science. The IPA has a history of lobbying for the tobacco industry, and I’ve got a nice little collection of climate-change denying and GM-promoting literature from them. They’re famously secretive about their funding sources, but they’re reportedy sponsored by Monsanto and other multinational giants. Now, with the ban on GM food crops up for review, since members of the Victorian government are happy to hold meetings at Parliament with whacko industry lobbyists, will it hold meetings with those whacko citizen-supported groups like, say, the Public Health Association of Australia, the Conservation Foundation, the Network of Concerned Farmers, the Union of Concerned Scientists, Greenpeace and GeneEthics? After all, these independent (of industry funding) groups, unlike the IPA, have widespread electoral support. In a democracy, you’d think that counts. But somehow I don’t think so. I had a word with a couple of these groups this morning. They tried to RSVP to go to this closed-shop meeting, but they were told they couldn’t. So come on, guys at Labornet, defend this one. Revegetated nature strip in Rennie Street, Coburg. Fanged if I can figure why urban councils don’t encourage nature-strip vegetation (other than lawn and maybe a single tree). After all, it’s in their best interests. Houses in and around Separation Street, Northcote, used to overlook a municipal tip until the council transformed the site into All Nations Park, he says. Not surprisingly, values soared. “Property values went up overnight by 20 to 30 per cent,” Mr Valentic says. 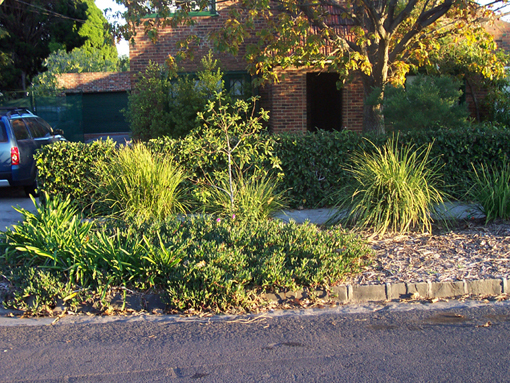 In light of current urban planning values, lawns are as outmoded as the Cyprus hedge. There are some very inspirational native nature-strips around Westgarth, and some orchard strips as well. I was intrigued by a link provided by Marty in his comment about an earlier post on urban farming. He linked to a site discussing the philosophy and practice of guerrilla gardening (or ‘green graffiti’). I’m scheming a bit of guerrilla gardening myself. My Loquat tree spawned hundreds of baby trees this summer, and I’m nursing them to replanting stage. I’m going to target specific bare nature-strip sites around Coburg and plant them at the end of winter. 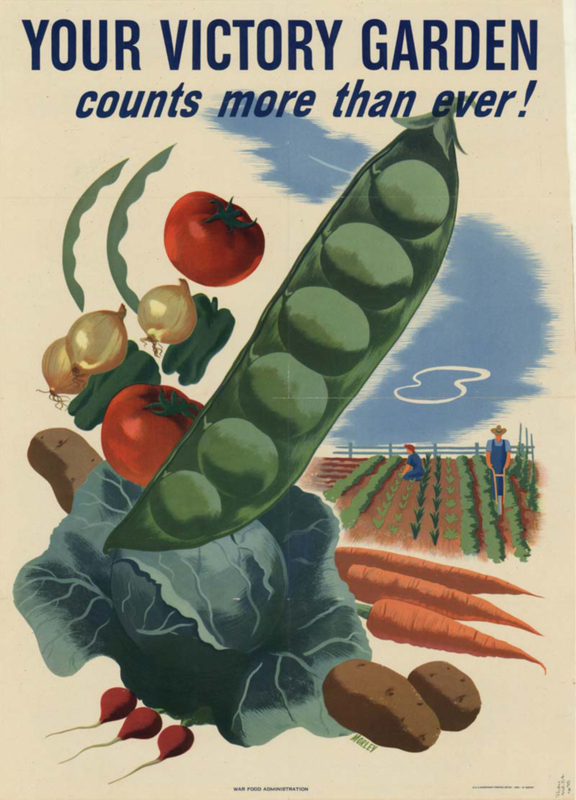 Hopefully people will leave them to grow and fruit, so Coburg can enjoy the Victory garden philosophy. I shall document my endeavours: watch this space. Oh, Bettina, Bettina. In your plagiarised article, syndicated in newspapers Australia-wide, you claimed that organic food was more dangerous than factory-farmed food. There are too many outright lies in this copied-and-pasted industry spin article to unpack here, but they have been adequately discredited elsewhere. But you got me thinking about the ongoing lobbying efforts to discredit organic food — even in our suburban vegie patches. Recently, our own Melbourne Times printed some typesetting claiming the answer for home vegie gardeners could be genetically modified crops. This is WAY unlikely, Kirsten. For a start, no such GM commercial crops exist, or have been field-trialled. And repeatedly, industry and independent polling shows that the overwhelming majority of Australians don’t want GM. And a poll by the South Australian Farmers’ Federation revealed 80 per cent of farmers didn’t want it, either, and supported a moratorium on it. There’s no reason to suppose we urban farmers will feel any differently. And the rhetoric of drought-tolerance coming from industry isn’t matched by peer-review studies. The promises of (patented, monopoly-owned) GM crops — lower yields, drought tolerance, pesticide tolerance, save the third world — look good, but are simply not backed by evidence. Liberated from the old biological constraints, the farm could now be managed on industrial principles, as a factory transforming inputs of raw material–chemical fertilizer–into outputs of corn. Since the farm no longer needs to generate and conserve its own fertility by maintaining a diversity of species, synthetic fertilizer opens the way to monoculture, allowing the farmer to bring the factory’s economics of scale and the mechanical efficiency to nature. More than this. Nitrogen fertilizers decrease our food’s nutrient content. Graham Harvey has documented the ways nitrogen fertilisers don’t stimulate nutrient density, but they do cause excess growth of sappy tissue within plant cell walls. Repeated studies show animals and plants fed chemical fertilisers are lower in the essential vitamins and minerals than organically-fed animals and organically-grown food. Although Bettina’s plagiarised article reckons the opposite. We home gardeners, even those who buy our fertilizer from Bunnings, tend not to pullute river systems with petroleum fertilizer run-off. And we use far less water and energy to make our food. Even if you do believe Bettina’s claims that organic food isn’t tastier (it is), and isn’t more nutritious (empirical studies show it is), for these reasons alone we should be encouraged by the state to grow the stuff. If the State is really interested in sustainability and public health, that is. And there’s no better place to grow it than in our fertile, intensive backyards, where we can use much less water and energy than broadacre farmers. Having moved house this year, we don’t have a quince tree. But we harvested far more quinces from Coburg’s laneways than we ever managed to grow on our bug-infested Brunswick tree. This is just part of our harvest from an afternoon walk, during which we collected apples, pears and quinces. There were also grapes, lemons and figs overhanging the lane, and remnants of hundreds of plums gone to waste. Coburg lanes are like Victory gardens. I like the recipes that tell you to chuck in pips, cores ‘n’ all. And instead of stirring for hours, after stirring for about half an hour, I let the paste thing happen over a couple of days. You spread it onto trays and put it first in the oven on low heat, during which time you repeatedly mesh the crust that forms into the rest of the sludge. Then, when it starts resembling soft paste, you put it in the hot sun under a tea-towel and do same. Stephanie Alexander writes of one chef who puts the sludge on a tray in the back window of the car until it goes lovely and leathery. After that, it’s divine quince paste with soft white cheese. Mmm… paste.